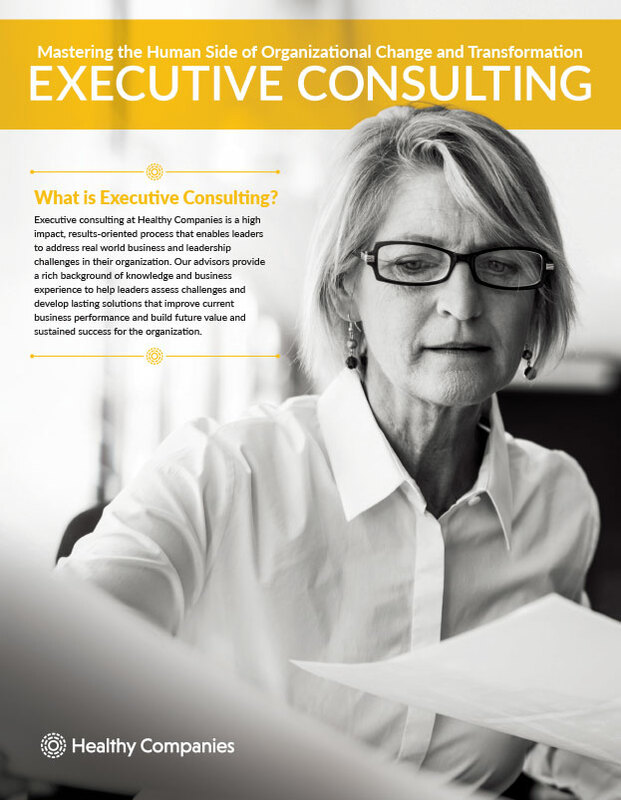 Executive Consulting is about creating ways to maximize business performance and enhancing your leadership capability. Executives across the board deal with one constant: change. This change is driven by six key disruptors: Speed, Impermanence, Competition, Technology, Complexity and Globalization. The result of these disruptors is a world that is changing faster than the ability of organizations to adapt. Executive consulting at Healthy Companies is a high impact, results-orientedprocess that enables leaders to address real world business and leadership challenges in their organization. Our advisors provide a rich background of knowledge and business experience to help leaders assess challenges anddevelop lasting solutions that improve current business performance and build future value and sustained success for the organization. At the heart of the challenge is leadership: developing and leveraging the capabilities of leaders at all levels to guide their organization through change with confidence and success. In utilizing the resources of our consultants, executives can discover and execute new and compelling leadership and culture strategies that increase an organization’s alignment, effectiveness, and capabilities as a high performing, adaptive organization. Are you frustrated by the speed of change in your organization? Find out 5 Strategies to Accelerate Positive Change. 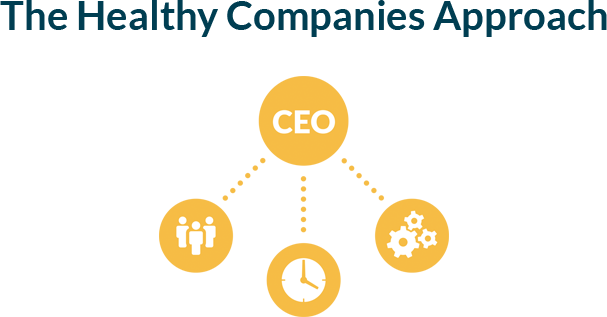 Seeing the organization from the seat of the CEO iscritical to maximizing the value of the whole organization. Our approach brings this CEO perspective into our work with executive leaders and their teams as they problem solve around key challenges and strategies to realizing the full potential of the organization. Every organization is unique with its own history and set of strengths, shortcomings and challenges that influence how it thrives in today’s world. Honoring and leveraging this kaleidoscope of dimensions ensures the work starts with the organization and not a generic approach applied in all situations. Organizations have the distinct paradoxical challenge of evolving for the future, while at the same me, delivering current results. Bringing our perspective and helping leaders to balance the work of change within these two realities is critical for lasting success. The strength of an organization overall is greater than the sum of its parts. Our approach looks at the overall capabilities and individual parts of an organization, as well as how the parts work together as a system. This enables key areas of the organization to thrive separately and as part of the broader enterprise. Adapt and thrive in an accelerating and disruptive world. Schedule your exploratory call today.